I was making a large batch of salted caramel ice cream as a birthday treat for a friend the other day so I had a lots of egg whites leftover. Never one to throw good food away I had to use them up somehow. 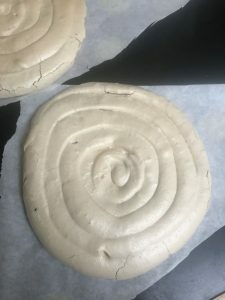 Biscuits are a great way of using up a couple of egg whites, Ricciarelli biscuits and Cherry blossom or Christmas Florentine Recipe are both on my blog and are delicious and quick to make. If you’re feeling in the party mood, why not make a cheeky cocktail or two. I make a mean pisco sour and a very drinkable gin fizz! 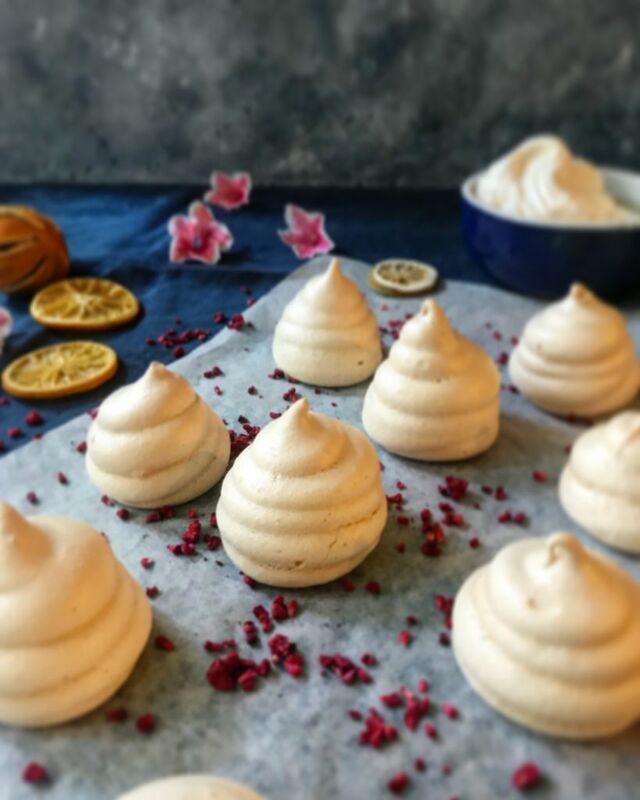 However if you have a lot of egg whites meringues are probably the best way to go. Also they will keep well in an airtight container for a week or two. 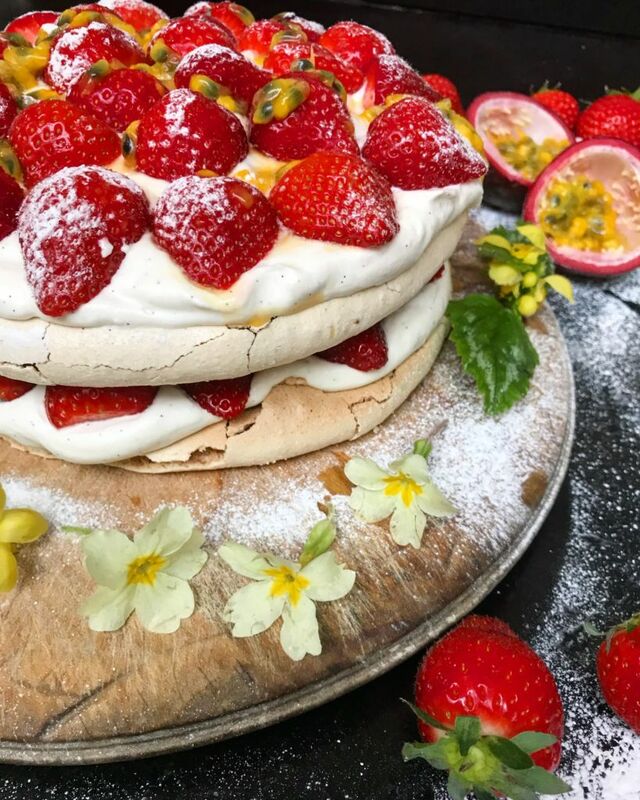 You can fill a pavlova with any fruit you like, fresh berries are lovely and colourful in the summer, in autumn, roast plums with vanilla and blackberries are yummy and in spring the new pink shoots of rhubarb roasted with ginger and orange zest make a stunning combo. 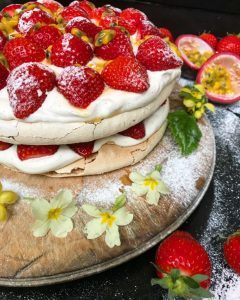 A little tip for quantites when making meringues or pavlova is the 2:1 ratio of sugar to egg white. ie for very ounce/25g of sugar you use 1 egg white. Some people like to add a teaspoon of cornflour mixed with vinegar to stabilise the meringue but personally I don’t usually bother, unless I’m piping it. It will mean the meringue is more fragile so more likely to crack… gives it a little more homemade feeling! Preheat the oven to 150C. Line two large baking trays with baking parchment. Place the egg whites in a large clean mixing bowl and using an electric whisk beat the egg whites till they are white and form soft peaks. Slowly add the sugar a tablespoonful at a time. Carry on mixing until the meringue is stiff and glossy. (You can test this by inverting the bowl over your head if you dare, don’t worry nothing should happen!) Stir in the cornflour, vinegar and vanilla if using. Place the meringue in a piping bag and pipe 2 large circles (25cm diameter). If you do not want to use the piping method, just mark out 2 x 25cm circles on the paper and spread the meringue about 2cm thick over each circle. Any left over mixture can be used to make meringues. Cook the meringue in the centre of the oven for about 60-70 minutes then turn off the oven and allow the meringue to completely cool in the oven. Whisk the cream till it for soft peaks. To assemble the pavlova. Place 1 circle on a pretty plate and carefully spread half of the cream over the top. Arrange 1/2 of the strawberries over the cream. Cut one of the passion fruit in half and using a teaspoon, scoop out the seeds and scatter over the strawberries. Place the other circle on top and repeat with the remaining cream. Arrange the strawberries over the cream and scoop out the passion fruit and drizzle over the top and serve.